At 21, Giorgia Manfredi is a wealthy Cinderella in a golden cage. Trapped in her family's business — a luxury hotel on Italy's Lake Garda — she yearns for a normal life. When jogger Danny Davies rescues her from a mugging, Giorgia finds that love comes at a price, bringing with it hostility, deceit — and conflict. Can she forgive those she loves and find happiness with the man who’s stolen her heart? A few weeks ago Jennifer contacted me about her latest release Running Man and offered me an ARC in exchange for an honest review. 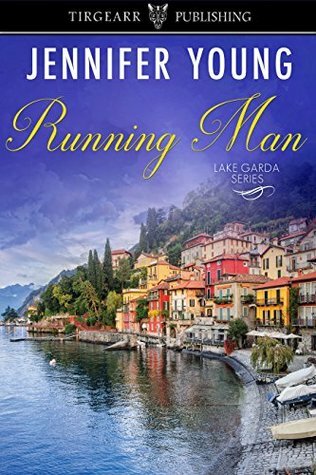 I love NA books and Running Man is a great addition to the genre, when it opens we meet Giorgia Manfredi, a young wealthy woman who is poised to take over the hotel that is in her family but wants to live a little before that happens. I absolutely loved Giorgia and she was a breath of fresh air, from the moment she appeared she had my backing. This book is told from the perspective of Giorgia, Matt (a manager at the hotel her family owns) and Danny, the man who has caught Giorgia's eye and is the total opposite of who her family would want her to land up with. You see Danny has a dark past that links with Giorgia (which, if you have read the other two books, you'll know - but that doesn't detract from the story) and my heart broke over that, everything is playing against these two and I honestly didn't see a way that things would work for these two but I wanted them together. I have to take a moment to talk about Danny, he meets Giorgia after coming to her aid when she is mugged and he is lovely, yes, he made a mistake but he is doing all he can to change his life and help his mother. He is truly awesome and I really loved him. When he is with Giorgia, you can see how much she means to him and he to she and that was why I needed them to be together and was hoping against hope that would happen. Of course, things don't run smoothly and there's an event in the latter part of the book that changes everything. You see, Matt is after Giorgia's affections too but not for a truly pure reason and he takes drastic steps to get what he is after which affects the hotel and Danny and Giorgia's relationship. I truly hated him in that moment and really want to see him get his comeuppance. All in all, this was a fun read and the characters were intriguing.